It can be difficult for most of us to get enough vegetables in to our diet, but it’s even harder if you don’t like vegetables at all. This slow cooker hidden vegetable pasta sauce has the vegetables all blended up in to it, so you won’t even know there are there. When it comes to pasta sauces, I am a firm believer in low and slow. It allows all the flavours to really fuse together and putting it in the slow cooker means you don’t have to keep a an eye on it like on the hob. Or have the sauce splattering up your cabinets. You can have this bubbling away in your slow cooker and then when you get home all you have to do is put some pasta on and blend up the sauce to stir through. Simple comfort food that is packed full of vegetables. The best thing about this recipe (apart from how easy it is in the slow cooker) is that you can adapt it to suit your tastes, the season, or whatever you have in the fridge that needs using up. We went with aubergine, peppers, carrots, mushrooms, courgette and leeks, but you could use some of them, none of them or all of them. Get creative and use different vegetables every time. If you didn’t want to have just vegetables, then you could top it with some grilled chicken or salmon before serving. You don’t have to use this for pasta either, you could stir it through rice or put it on top of a baked potato. We are probably all feeling like we need a bit of a vegetable boost at the moment, I know I do. You don’t have to eat kale for breakfast and snack on carrots to make sure you are getting enough vegetables. Recipes like this give you a vitamin boost without you even knowing it – all whilst having the comfort of a pasta dish. This is the ultimate fussy eaters dish, because everyone loves spaghetti and sauce and this is bursting with vegetables, but you can’t tell. People usually think about meat when it comes to slow cookers, but we are here to show that there are so many vegetarian dishes you can do in it too. And delicious ones too! Our new book, The Healthy Slow Cooker, has over 50 vegetarian slow cooker recipes in it, like Creamy Mushroom Stroganoff, Butternut Squash Risotto, Lentil Ragu and Greek Potatoes. That’s right, we have a new book out! The Healthy Slow Cooker has 100 delicious slow cooker recipes in it (over half are vegetarian) that will show you how to get so much more out of your slow cooker than just stews. There are breakfasts, side dishes, desserts and drinks. Click here to order your copy of The Healthy Slow Cooker. One: Put all of the ingredients in to a food processor using the chopping attachment and chop them up. You can chop by hand, but a food processor will save you time. 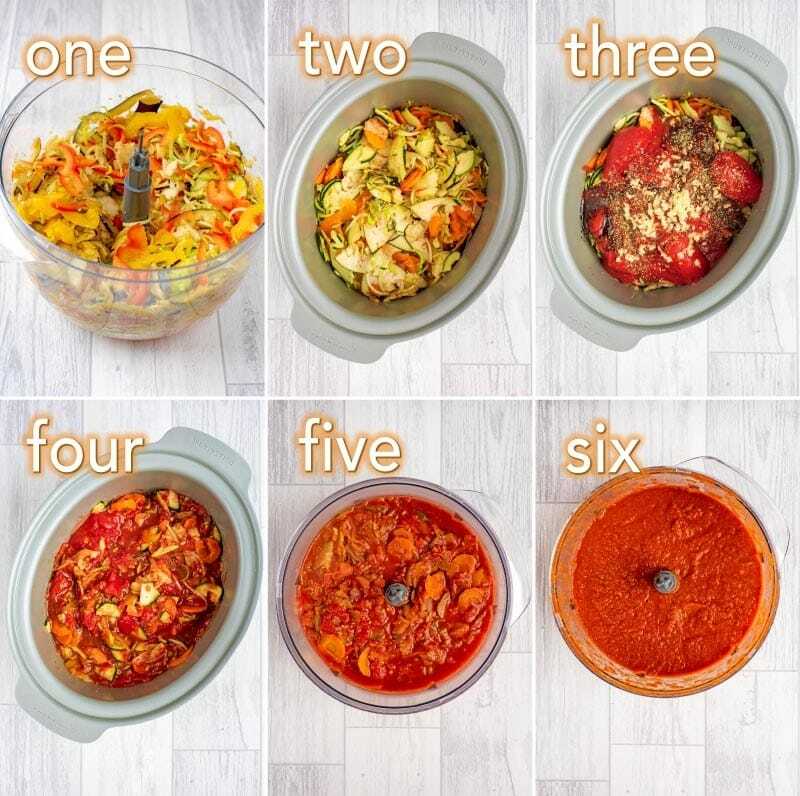 Two/Three/Four: Put all of the ingredients, including the chopped vegetables (except the pasta, rocket and parmesan), in your slow cooker bowl and cook on high for 4 hours or low for 6 hours. Five/Six: Leave the sauce to cool and then pour it in to food processor in small batches and blend the sauce until smooth, or leave chunks if you prefer. Get creative and use a selection of different vegetables based on personal preference, season or what you have in the fridge. If you don’t want just vegetables, then top the dish with grilled chicken or salmon before serving. This sauce would go well with rice or on a baked potato too. 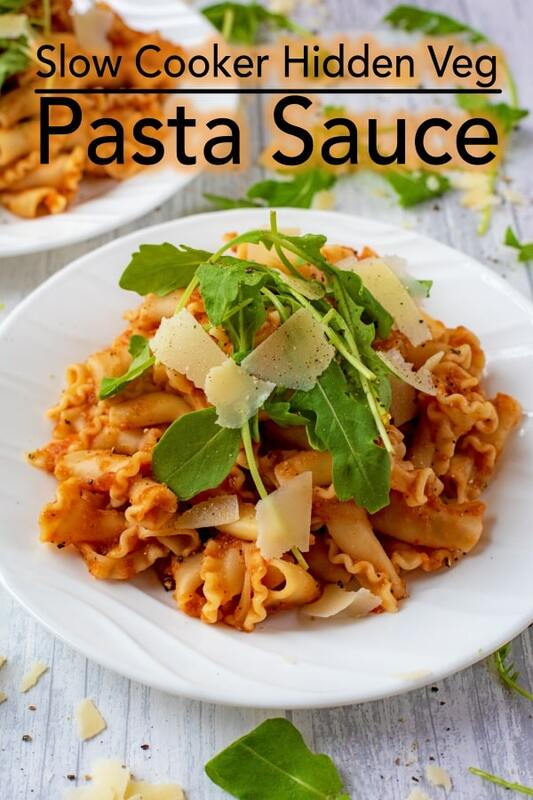 Do you want to be kept up to date on more delicious posts like this Slow Cooker Hidden Vegetable Pasta Sauce? Please subscribe to the blog mailing list (it takes 30 seconds). 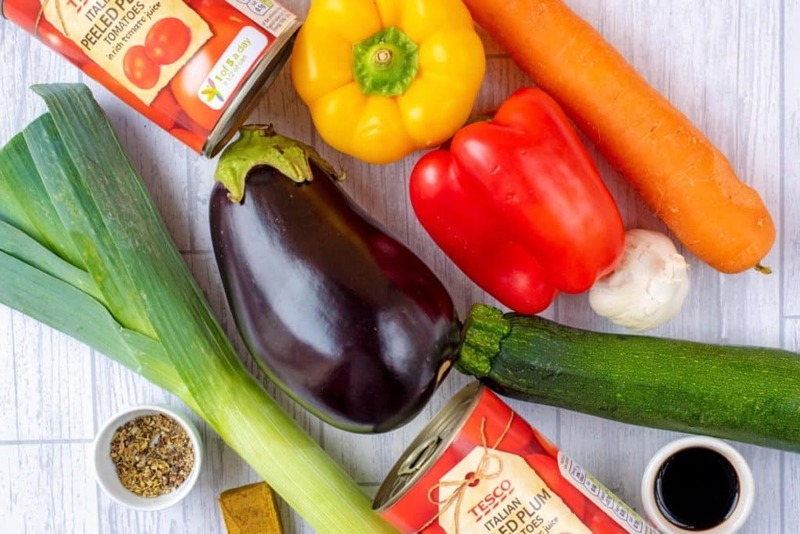 If you’ve tried this Slow Cooker Hidden Vegetable Pasta Sauce, or any other recipe on the blog, then let us know how you got on in the comments below, we love hearing from you! You can also FOLLOW US on FACEBOOK, TWITTER, INSTAGRAM and PINTEREST to see more delicious recipe ideas, behind the scenes shots and also what we are getting up to. This slow cooker hidden vegetable pasta sauce has the vegetables all blended up in to it, so you won't even know there are there. Put all of the ingredients in to a food processor using the chopping attachment and chop them up. You can chop by hand, but a food processor will save you time. Put all of the ingredients, including the chopped vegetables (except the pasta, rocket and parmesan), in your slow cooker bowl and cook on high for 4 hours or low for 6 hours. Leave the sauce to cool and then pour it in to food processor in small batches and blend the sauce until smooth, or leave chunks if you prefer. If you don't want just vegetables, then top the dish with grilled chicken or salmon before serving. very simple and delicious meal! loved by all the family.Thanks for sharing! I am glad everyone enjoyed it. Thanks for coming back and letting me know. That sounds really scrummy. I plan to make that tomorrow. If I keep the amount of pasta to a minimum and have lashings of that lovely sauce, it will help me lose weight too. This pasta looks absolutely wonderful and delicious I like all the hidden vegetables in it. 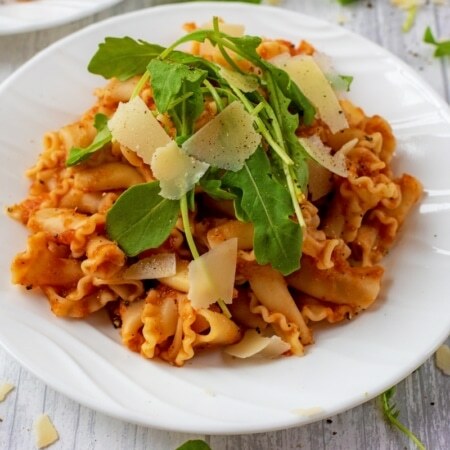 This is a wonderful recipe for bulking up a pasta dish with veggies, and I love the idea of adding in arugula – such a great layer of spicy flavor! Good for you for not doing a January detox. I think just eating normally and sensibly with recipes like this is all you need. 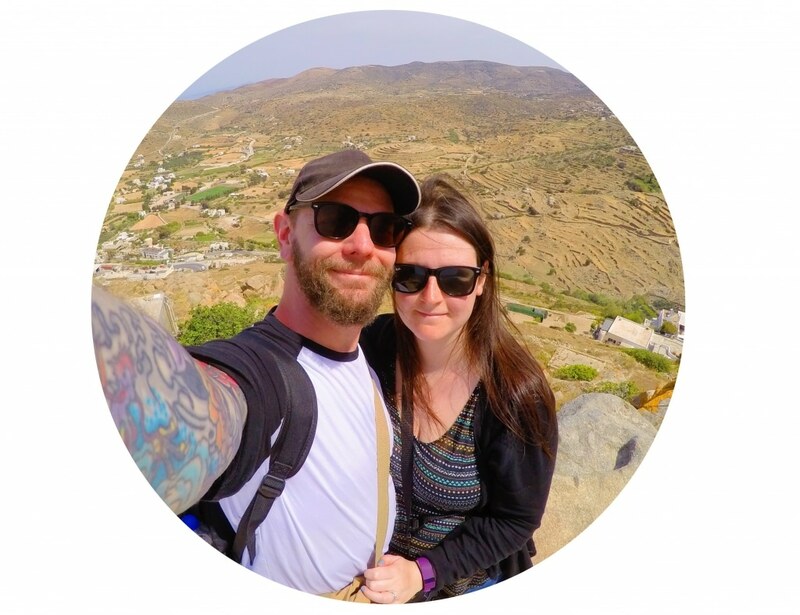 And I loved seeing your pix from your Iceland trip – such fun! My daughter went on a school trip there and is wanting to go back there with me. Must do that before she changes her mind! Mmm loving the sound of this! We hide veggies in our pasta sauces too, for the kids, but nothing like this. Pinned to try later! Loving all the hidden veggies in here! My favorite way to hide them is in sauce! A lovely simple dish to make in the slow cooker. Things always taste so much better when they are cooked slowly. This is a great idea! I have never thought to make pasta sauce in the slow cooker, but I shall definitely give this a go. My slow cooker is my best friend but I definitely need to do some new things with it. Hope you are having an amazing time away.